Living in a tropical climate is wonderful and has been proven to have a variety of health benefits, from better blood pressure to reduced illnesses. However, living in these warmer climates often means having to deal with the repercussions of tropical storms and the storm aftermath. Whether it is simply a small thunderstorm with strong winds or a full-blown tropical cyclone, cleaning up afterward can be a daunting task. Storm winds can cause a build-up of plant debris, dust and dirt in your yard and possibly inside your home too. 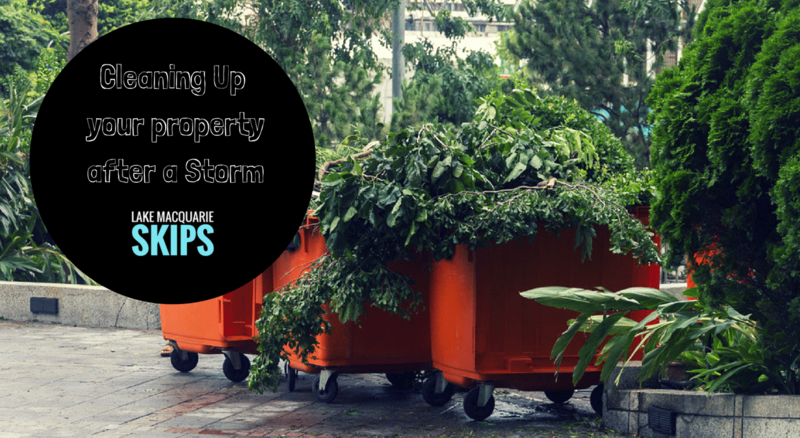 Cleaning up after a storm can be a big task, and unfortunately it needs to be done as soon as possible after the storm hits. How do I ensure my own and my family’s safety when cleaning up after a storm? After a tropical storm, there can be a number of dangerous situations when clearing out the debris. Before you begin your clean-up mission, evaluate the area to ensure there are no hazards, such as fallen power lines or damaged trees that can fall easily. If there are any fallen power lines or electrical appliances that have become wet in the storm, refrain from touching any of them to avoid electrocution and further damage to your property. Contact your local authorities to report the situation and to organise a professional to help you clear the electrical hazard before you attempt to clear any debris in the immediate vicinity. Avoid moving any heavy objects on your own that could result in personal injury. Rather contact a refuse removal company that are well-equipped and knowledgeable to help you move these heavy objects safely. Also, check to ensure that the debris hasn’t been contaminated by water from sewerage systems and drains that may have been overwhelmed by the storm waters. How useful is a skip bin need to clean up after storm? Before you begin your clean-up operation make sure you have all the right equipment. In order to adequately remove all the dirt and debris from your yard, and possibly your home too, you will need a variety of tools and equipment. Racks, brooms, and garden refuse bags can help to collect garden debris into manageable piles and sweeping up dust and dirt inside your home. You can also benefit from hiring a large skip bin to remove all the rubbish and debris from your property. A skip bin is a convenient way to help you clear out the rubble, as skip bin companies will deliver the skip and remove it to dispose of the rubble for you. These companies will also take the contents of the skip bin to the correct place to be disposed of, making the situation more easily manageable for you. What do I do if there is substantial damage to my home or my vehicle? The first thing you will need to do if there is damage to the structure of your home or your vehicle is to take photographs. Many insurance companies will ask for photographic evidence of any damage in order to assess your claim efficiently. Also, be sure to obtain permission from your insurance provider before repairing any items, as they may have limitations on where you may have them repaired or the service provider they will pay for and how much they are allocated to pay out. Bear in mind that your insurance company may be overwhelmed with numerous claims at the same time as a result of the storm, so try to be patient when waiting for information regarding the payout. If you repair any items before hearing back from your insurer, you may not be eligible to claim. How can I prepare for future storms? Cleaning up after a storm can help you to realise what you can do to prevent vast damage, or minimise the damage during future storms. Make sure your garden is always well-maintained. Keep trees and hedges trimmed back, and clear away any fallen leaves throughout the year. You may also need to cut down any tree that can be prone to falling easily in a storm. This will ensure that if you do experience a tropical storm, there will likely be less plant debris and fallen trees to clear away. Check the structure of your home and ensure that all exterior materials are secured. Check things like the gutters, window frames, awnings, and any other materials that could be blown off with strong winds. Check your roof for any leaks to prevent rainwater from coming into your home where it can cause potential damage to your interior. It is a smart idea to implement a storm strategy for any future storms you may experience. Ensure you have sufficient torches and batteries, a fully-stocked first aid kit as well as non-perishable foods in case of an emergency during a storm. Your strategy may also include things to do prior to a storm when you know it is on the way, such as bringing in any garden furniture, covering your swimming pool and parking your car undercover. Avoid the exorbitant costs of repairing the damages caused by tropical storms, by securing your property and implementing a preventative strategy. Have another strategy in place for cleaning up after a storm that includes hiring the right equipment and contacting your insurance provider.